A staple in the line, the 2017 Harley-Davidson Sportster 1200 Custom is a classic cruiser that is accessible to newer riders, while providing the style and power needed to compete in urban environments. While I certainly enjoy big-inch Harley-Davidsons in town, the sub-600 pound weight of the Sportster 1200 Custom makes it a much more manageable motorcycle in busy areas. The narrow, gently pulled back handlebar means the Custom doesn’t need much room to work its way through traffic. The torquey 1202cc Evolution motor has plenty of thrust down low—peak torque of 71 ft/lbs comes at 3500 rpm—and that means needed acceleration is on tap at any engine speed. As with all the Sportsters, starting up the 1200 Custom is a pleasure—the beast rumbles aggressively to life at the touch of a button. Rubber mounting provides a smooth ride once underway, and the motor shakes ably at stoplights. While not especially loud, the staggered exhausts have a good sound. Riding the Sportster 1200 Custom has a sense of effortlessness, as response to rider input is fully predictable and intuitive, and certainly not lightning quick in response. The forward foot controls, comfortable two-up seat, and the friendly handlebar are the rider ergonomics that define cruiser. Harley-Davidson outfits the Custom with identical 16-inch wire-spoke wheels front and back, and the tires mounted are nearly the same width—the rear Michelin Scorcher 31 is just 20mm wider than the front. This balance makes the Custom easy to ride, and unintimidating. Additionally, rider comfort is assisted by the high-profile tires that blunt hits before they get to the limited suspension travel. 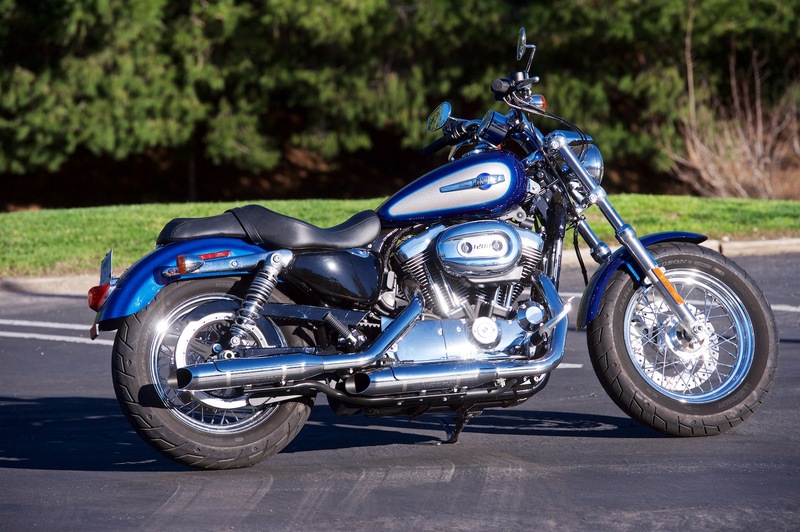 To keep the Sportster 1200 Custom low—seat height is just 28 inches—Harley-Davidson goes with shorter suspension. That limits cornering clearance, and you can easily touch down the feelers. While the rear suspension allows just a touch over two inches of wheel travel, it makes the most out of it with the newer spring-preload adjustable emulsion shocks—you really do think there’s more. The single cartridge fork design is a decent match, though the 4.1 inches of front suspension travel is hardly plush. 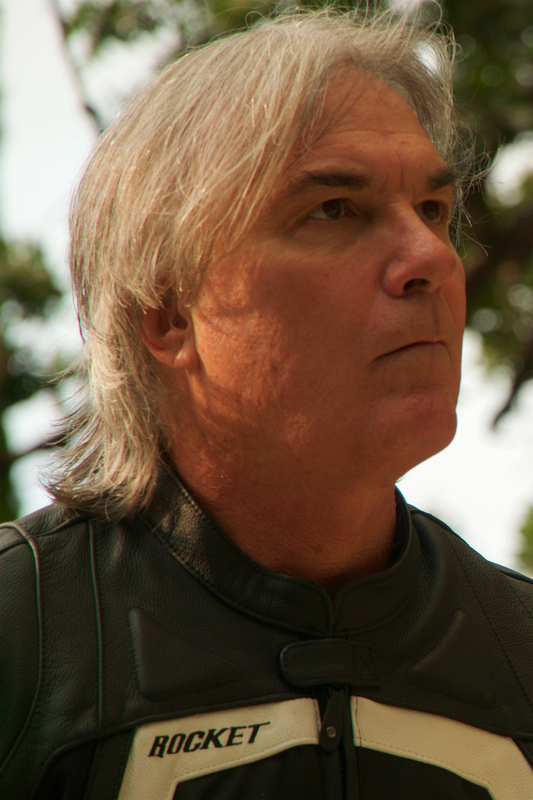 You will feel the rougher road, which I don’t really mind on the Custom, but hard jolts are usually kept from the rider. Everything about the 2017 Harley-Davidson Sportster 1200 Custom says mellow attitude. The engine doesn’t rev at a rapid pace, the 30 degrees of rake and wide front tire slow down steering, cornering clearance is limited (particularly on the right), and the riding position is casual. Canyon runs are best taken at a friendly pace, as either your boot heel or the peg feelers will hit the pavement regularly. With the relaxed chassis and meaty front tire, the Sportster 1200 Custom feels very stable in corners. For newer riders, the sense of security is abundant. For seasoned riders, just kick back and ride with confidence. The Michelin Scorcher 31s definitely do their part, and tire performance is never an issue. While there is a touring version of the Sportster 1200 Custom, this standard version is not especially freeway friendly. Lacking a windshield, the seating position if vulnerable to windblast. Also, on the rough freeways you’ll find in the city, the suspension gets overwhelmed because it can’t handle the repeated bumps of expansion joints. Smooth highways, of course, are no problem. When it comes time to brake, don’t have big expectations. The 300mm front disc is decent, and it does have a nice slab of rubber up front. The rear brake, however, will do most of the work. It’s nearly as big, the tire is wider, and that’s where most of the weight sits. ABS is a $795 option and was on our test bike, though it will be far more useful in slick conditions—activating it in the dry requires intention. With a comfortable seat and sensible riding position, the 4.5-gallon tank comes in handy because you won’t feel the need to stop for high test frequently. With the estimated fuel economy of 48 mpg, you will get well over 150 miles out of the tank before the low fuel light comes on—there is no fuel gauge. The 2017 Harley-Davidson Sportster 1200 Custom is one of those pure motorcycles. It has everything you need for a ride, and doesn’t clutter things up with unnecessary accoutrements. It’s not the fastest, best handling, smoothest, or plushest ride out there, but it’s a great reminder of what motorcycle riding is all about. Get An Insurance Quote For The 2017 Harley-Davidson Sporster 1200 – Save Up To 50% with Allstate!